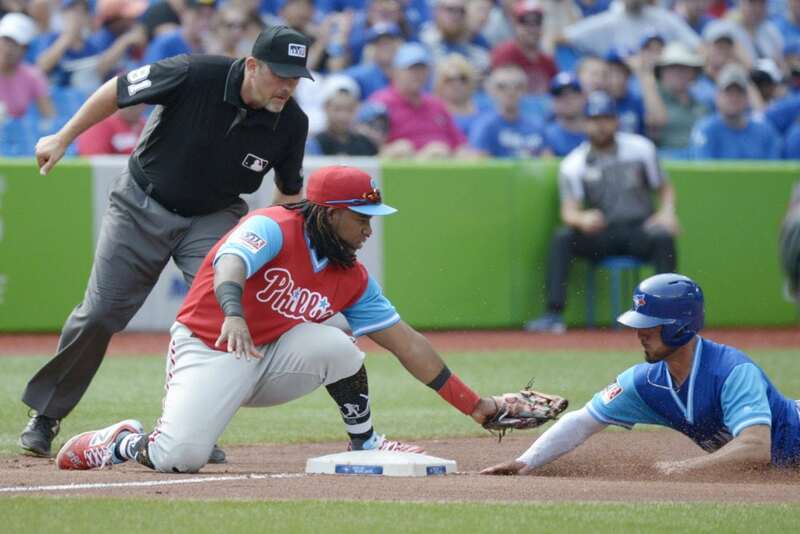 TORONTO (AP) — Rhys Hoskins and Carlos Santana hit back-to-back home runs, Maikel Franco and Wilson Ramos each had two-run shots and the Philadelphia Phillies beat the Toronto Blue Jays 8-3 on Sunday, avoiding a three-game sweep. Vince Velasquez (9-9) allowed two runs and three hits in five innings for the victory as Philadelphia won for the second time in eight games. The Phillies began the day three games behind Atlanta in the NL East, and two games out in the wild card race. Kendrys Morales set a Blue Jays record by homering for the seventh consecutive game, hitting a two-run shot off Velasquez in the third. Morales, who leads the Blue jays with 21 homers, is the seventh player in major league history with a home run streak of at least seven games. Ken Griffey Jr., Dale Long, and Don Mattingly share the all-time record with home runs in eight straight games. Hoskins reached base four times as the Phillies ended Toronto’s winning streak at five. Hoskins opened the scoring with a one-out drive off right-hander Marco Estrada in the first, his 26th. Three pitches later, Santana doubled the lead with a blast to right, his 19th. It was the third time this season the Phillies have hit back-to-back home runs. Ramos hit an RBI double in the second and the Phillies chased Estrada in the third. Asdrubal Cabrera led off with a double, Franco celebrated his 26th birthday with his 22nd home run, and Odubel Herrera walked before Justin Shafer came on in relief. Estrada (7-10) allowed five runs and seven hits in two-plus innings. 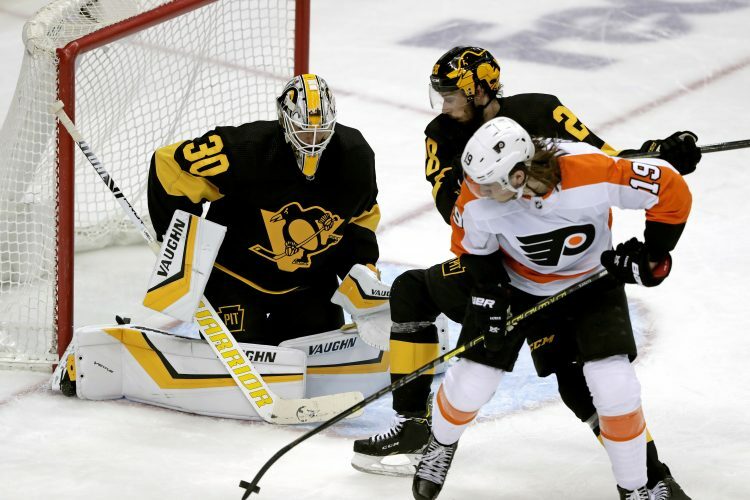 MILWAUKEE (AP) — Mike Moustakas and Manny Piña each hit a two-run homer in the third inning, Jonathan Schoop went deep in the seventh and Milwaukee beat Pittsburgh. The Brewers rocked Chris Archer (4-7) for six runs and six hits in the third. Schoop homered in the seventh off Nick Kingham. Chase Anderson (9-7) cruised through the first four innings for Milwaukee but fell apart in the sixth. Adam Frazier hit a two-run homer and Polanco followed with a drive that pulled the Pirates to 6-4. Jeremy Jeffress worked the ninth for his seventh save. ST. PETERSBURG, Fla. (AP) — Blake Snell pitched two-hit ball over six innings and Tampa Bay won its eighth straight game, handing the major league-leading Red Sox their first sweep of the season. NEW YORK (AP) — Trea Turner set off a lively dugout celebration after scoring a run that ended Washington’s 32-inning scoreless drought and then the Nationals really went wild at the plate, hammering New York. The Nationals had been shut out in three straight games — for the first time since the team moved from Montreal to Washington in 2005 — before Juan Soto’s RBI groundout in the sixth. The lopsided win came with a cost, though, as reliever Kelvin Herrera was carted off the field with one out to go. He handled Jose Bautista’s grounder, but hurt the top of his left foot running to first base and hopped to the bag. Herrera was on crutches and wearing a boot after the game. The Nationals said they didn’t yet have an update on his injury. KANSAS CITY, Mo. (AP) — Jason Kipnis hit an inside-the-park homer and finished with four RBIs, Edwin Encarnacion added a two-run shot and Cleveland beat Kansas City to snap a four-game skid. Kipnis rounded the bases for his two-run homer in the ninth inning, when his high flyball to right field bounced off the top of the wall and into no-man’s land. It was his second career inside-the-park job and the second for the Indians this year. CHICAGO (AP) — Kyle Hendricks allowed two hits in seven innings, David Bote and Kyle Schwarber homered and Chicago beat Cincinnati to complete a four-game sweep. DENVER (AP) — Matt Carpenter tied a St. Louis record with four doubles, pitcher Austin Gomber had a two-run infield single in a six-run first inning, and the Cardinals routed Colorado. Gomber threw six efficient innings and the Cardinals took two of three from the Rockies in a series between NL playoff contenders. MINNEAPOLIS (AP) — Matt Chapman homered twice, Jed Lowrie drove in three runs with a homer and double, and Oakland’s bullpen preserved an effective outing by call-up Chris Bassitt in a 6-2 victory over Minnesota. Oakland maintained at least a four-game advantage for the second wild card spot over Seattle. The A’s open a three-game series Monday at AL West-leading Houston. MIAMI (AP) — Kevin Gausman and four relievers combined on a two-hitter, and Atlanta beat Miami despite an ongoing offensive slump. The Braves earned a split even though they scored just seven earned runs in the four-game series. The NL East leaders finished 14-5 against last-place Miami this year. Gausman (4-1) pitched five innings before departing for a pinch hitter. The right-hander won his fourth start in a row and has an ERA of 1.69 in five outings since Braves acquired him from the Baltimore Orioles on July 31. ANAHEIM, Calif. (AP) — Framber Valdez gave up one run over five innings in his first career start, and Houston beat Los Angeles for its fifth straight win. The Astros improved to 47-21 on the road, including an 18-5 mark in California. PHOENIX (AP) — Paul Goldschmidt hit his 30th homer, Zack Greinke won for the first time in almost a month and Arizona avoided a three-game sweep at the hands of Seattle. With the victory and Colorado’s 12-3 loss to St. Louis, the Diamondbacks were back alone in first place in the NL West. Goldschmidt’s three-run shot off Mike Leake (8-8) punctuated a five-run third inning for the Diamondbacks, who bounced back from blowing a two-run lead in the ninth Saturday night and losing in 10 innings. LOS ANGELES (AP) — Justin Turner drove in five runs while Manny Machado put Los Angeles ahead with a two-run homer, and the Dodgers swept a three-game series against San Diego. Hyun-Jin Ryu (4-1) gave up 11 hits in his 5 2/3 innings, but held the Padres to two runs. The Padres gave left-hander Robbie Erlin (3-4) the early lead with a solo home run from Franmil Reyes in the second and Hunter Renfroe’s RBI single in the third. DETROIT (AP) — Michael Kopech pitched six impressive innings for his first major league win and Chicago scored four runs in the third against Detroit. Kopech (1-0) allowed a run and seven hits in his second career start. The highly touted right-hander was limited to two scoreless innings when it rained in his debut Tuesday against Minnesota. He threw 86 pitches this time, finishing with four strikeouts and no walks. SAN FRANCISCO (AP) — Derek Holland pitched three-hit ball into the seventh inning to beat his former team as San Francisco topped Texas.